In the days when it was London-based CDs from Australia rarely crept through the vast portals of the metropolitan headquarters of The Irish Music Review (and are probably even less likely to be conveyed by Charlie the postie to its new Leitrim base), but one of the few to do so was this intriguing offering by David Hyams who hails from Fremantle and plays bouzouki, dobro, guitar, mandolin and bodhrán. 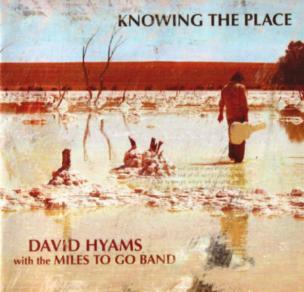 David has also composed all the tracks on Knowing the Place while his Miles to Go Band incorporates flutes, highland bagpipes, didgeridoo, cittern, bass, djembe, tap sticks, cello, uilleann pipes, concertina, tin whistle and trombones, plus guests variously wielding trumpets, congas, cymbals, basses, fiddles, various other percussion instruments and piano. It’s an international blend which brings together some unusual bedfellows (and believe me, there’s probably no other album in the world which features uilleann pipes and trombones simultaneously, a quite startling blend). Like the No Crows album also recently reviewed Knowing the Place is a veritable cornucopia of influences, only loosely connected to Irish traditional music and then perhaps only by tune forms, e.g. The Ocean Road Jigs or the reels Worlds Colliding/Chasing the Rainbow, though the presence of pipes, fiddle and concertina does provide an inherently ‘Celtic’ feel. At times Knowing the Place is reminiscent of Nightnoise, at others of Dónal Lunny’s work with Coolfin or, then again, of the Afro Celts or indeed Baka Beyond or (dare one mention?) Riverdance. Sometimes it’s all too frenetic with simply too many bodies at work, two many percussion instruments beaten or shaken, almost as if Hyams is intent on filling all of Australia’s wide open musical spaces. Yet at others, it’s deeply atmospheric, as on the soulful Leaving Jinparinya which marries Ormonde Waters’ concertina to slide guitar and dobro. Ultimately, it’s certainly an intriguing album and now available from a variety of online stores. For more details about David and the band visit www.milestogo.com.au.